E Q1 2019 EPS Forecast Take A Hit While S&P 500 Surges Through January 2019: Sustainable? With the S&P 500 now having retraced 60% of its Q4 2018 decline, many traders/investors are doubting whether or not the S&P will pullback or retest the December 2018 lows. Nonetheless, just like markets don’t go down in a straight line, they tend to not go up in a straight line either. With the S&P 500 in between two key gravity points at 2,731 and 2,682, we still anticipate some degree of a market pullback in the near future. Given the bullet points noted above regarding the S&P 500, let’s look at those key statistics we need to point out regarding the probability of a pullback. As depicted in the table above, we can see that the current state of the market/SPX suggests that over the next two weeks, at least, the market has historically delivered negative returns. To be fair, historically the conditions didn’t bear out a huge pullback during that time period and also look at the market 12 months later. That’s a pretty strong rally that we may witness if history is any guide. As it pertains to the statistical data represented in the table provided, could the current rally actually produce a V-shaped rally that leads to near, new highs and without a significant pullback before doing so? Again, in order to answer this question, we look toward history for context. It is not impossible for the S&P 500 to rally to almost a new all-time high before making a pullback/retest. This happened in 1957, and to a lesser extent in 2015-2016. So could the forecast for a pullback be proven wrong, yes! But the probability of it being wrong is very low and that is all we are trying to demonstrate with the table above. Given the data at-hand, what may prove most important is the long-term data that suggests a strong market performance over a 12-month period. As such, playing the “market timing” game where one attempts to actively position for pullbacks and surges has a 50-50 chance of proving more beneficial than passive long-term positioning. 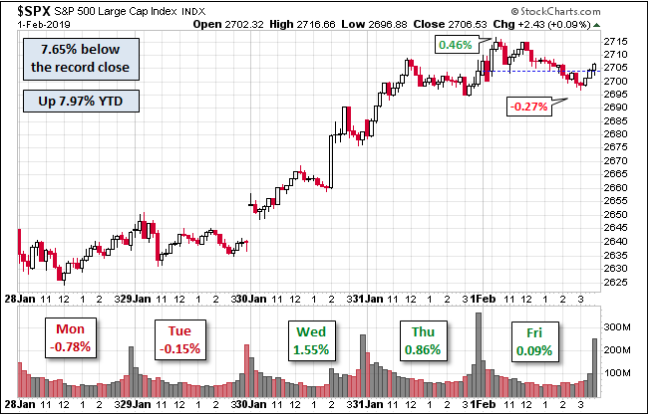 With that, let’s take a quick look at last week’s daily market moves and where the week finished out. The S&P 500 was up 2.37% from last Friday and is up 7.97% YTD. Much of what was lost in the Q4 2018 period has since been recovered, but the index remains roughly 8% from its all-time highs. Until a new all-time high is achieved, the S&P 500 remains in a downtrend within a corrective period. Last week the options market was pricing in a SPX weekly move of $47/points. On Friday, we saw the market move right up to and breach the weekly expected move as options expired and then pull right back inside of the weekly expected move. Efficient markets folks; efficient markets… at least for now. I’ve outlined in the past that as market volatility/VIX is reigned in, the weekly expected moves also tend to decrease in size. With the VIX falling below its 200-DMA for the first time since last October (16.14 at Friday’s close), we see that we’ve gone from a $47/point weekly expected move for the S&P 500 to nearly a $40/point weekly expected move this coming week. In short, the week ahead is expected to express less volatility. In contemplating and forecasting the market we have to reflect further on the market rally and why it has come to pass. The depths of the Q4 2018 correction came about, largely due to global economic policy uncertainty and how such policies might impact corporate earnings growth. Absent such concerns or uncertainty, U.S. corporate fundamentals were performing at record levels, but found with some setbacks due to slowing in China’s economic activity. Unfortunately, some of this slowdown in the Chinese economy was due to policy uncertainty related to trade with the United States. 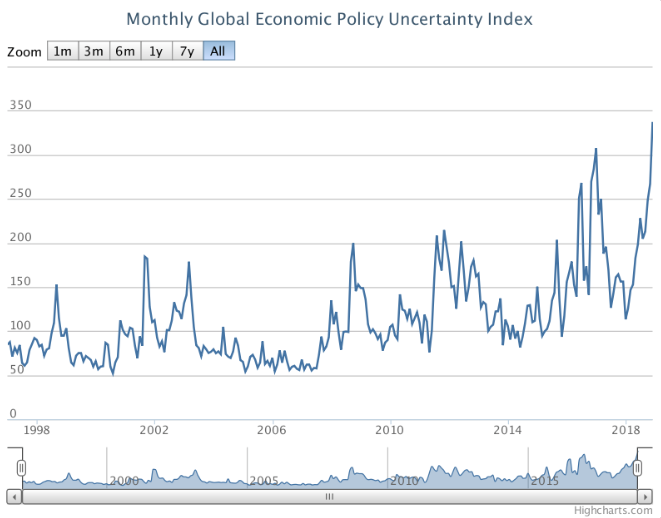 Ultimately, global economic policy uncertainty elevated to a record level and morphed out of control in Q4 2018 as liquidity was drained from equity markets. I’ve depicted, in the past, much of the macro-uncertainty around the world was manmade. Be it Brexit uncertainty, trade conflicts or central bank policies, most all that ailed economic conditions that filtered down to global equity markets had been manmade crises. Some of these uncertainties have since found some semblance of resolution or resolution is on the horizon. In the latest State Of The Market video by Finom Group (for whom I am employed), I go into great detail on how central banks are now presenting a more accommodative stance to economies and markets. While Brexit still demands a comprehensive resolution by late March, China/U.S. trade resolution has a March 1 deadline before additional tariffs go are slated for implementation. Last week, meetings between the two parties kicked into high gear with high-level delegates from both sides participating in what aims to be the precursor to finalizing a trade deal, comprehensive or otherwise. China’s leader Xi Jinping told U.S. President Donald Trump in a letter that he hopes both sides will be able to meet each other halfway to reach a trade agreement before a March 1 deadline, Trump said on Thursday. Here is a statement from the White House Administration regarding the latest round of trade talks and planning upcoming meetings between the leaders of the two nations. The inefficiency of tariffs are huge. Steel tariffs and the subsequent hope that China reduce its capacity for steel production seems to be a huge policy error. All we need for a slower world economy is higher priced steel. Add to this that Huaweii makes superior cellphones for a whole lot less money and American financial efficiency is doomed. Americans are being bled by Apple, by big pharma and by steel tariffs. Can you imagine where we would be as a nation if we had protected our pre Japan crappy auto companies? We will become a fossil of a nation for sure if tariff man isn't curtailed.